Through 2021, US demand for nonwovens will expand 3.4% annually to $8.0 billion. With over 70% of nonwovens sales associated with disposable goods, demand is driven by sales of end-use products such as wipes, personal hygiene products, and filters, all of which are largely mature nonwoven outlets. Demand for nonwovens will benefit from growth in construction spendng and battery production. Many markets for goods containing nonwovens, such as personal hygiene products, furniture, electrical and electronic goods and components, and medical supplies, will see sizable and rising portions of domestic end-use product demand met by imports rather than US-produced goods. This study covers the United States nonwovens industry, defined here to include materials made from fibers, filaments, and films, which are arranged into webs, batts, or sheets, then bonded together using mechanical, thermal, or chemical means. Historical data for 2006, 2011, and 2016 and forecasts to 2021 are provided for nonwovens production (total) and demand (by web formation process and by market) in current dollars (which are not adjusted to account for inflation). Total demand is also shown in millions of square meters and in thousands of metric tons. 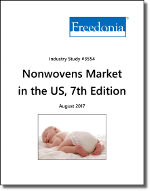 Totals for nonwovens presented in this study include captive production in downstream product manufacture, as well as goods sold on the merchant market. In addition, the study discusses environmental, regulatory, and other market environment factors. Nonwovens raw materials (e.g., fibers, binder resins, and additives) are also discussed. Key market segments for nonwovens include both disposables and nondisposables. The disposables market segments are also known as short-life markets since the products are designed for a single use or use over a very short period of time. The nondisposables market segments are also known as long-life markets because the nonwovens used in them are designed for repeated or long term use, and, in some cases, laundering.